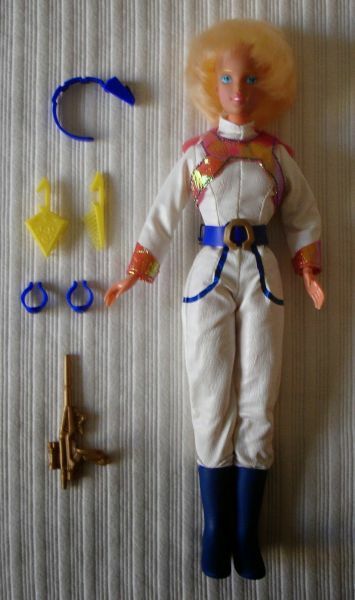 This doll is a rerelease of both Dana Sterling doll and Flight Uniform by Matchbox. You probably know that Robotech was not just an anime adaptation for American audiences but a blend of Macross, Super Dimension Cavalry Southern Cross and Genesis Climber MOSPEADA. The three series were originally combined into one to meet the demand for a longer series (Macross only had 36 episodes). A lot of characters from the original series were renamed, for example, Ichijou Hikaru and Hayase Misa became Rick Hunter and Lisa Hayes respectively. The character of Dana Sterling is the most outrageous example of adaptation: as a child she is represented by Macross character Komilia, while as an adult she has the appearance of Jeanne Fránçaix (Southern Cross). 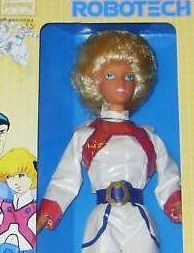 The USA dolls by Matchbox and Harmony Gold represent the characters under their Robotech names, although the designs clearly belong to the original series.